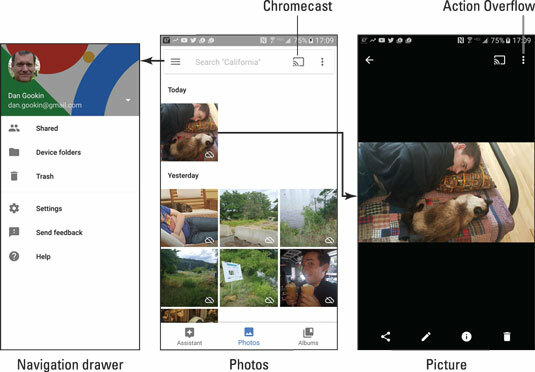 The Photos app on your Android phone organizes your photos and videos in several ways. The Photos screen, shown center in the following figure, lists photos by date. Tap the Photos icon at the bottom of the screen to see photos and videos listed this way. Choose Albums to view any photo albums you’ve created. Image organization in the Photos app. Tap an image to view it full-screen, as shown on the right. You can then swipe the screen left or right to browse your images. Videos stored in an album appear with the Play icon. Tap that icon to play the video. As the video is playing, tap the screen again to view onscreen controls. While you’re viewing an image or video full-screen, the navigation icons may disappear. Tap the screen to view them. Tap the Back navigation icon to return to an album after viewing an image or a video.